So what was in the pot this weekend?? Well last night I started a pair of Sandalwood candles. These two candles are going to be a new color combo for me; the client wanted a goldish yellow top and cranberry bottom. I have in the past made that gold color with a dark purple on the bottom. I can’t wait to pull that one out of the mold and see how great those two colors look together. I also started a pair of Rustic Woods square candles these are going to be cold pour candles in black and mahogany brown. Started the first of 5 batches of Jasmine soap they will be for a baby shower in May. It is funny how some people like different kinds of scents. I brought this client 1 of every bar of soap I have made and she didn’t like any of them. I soon figured out she was looking for floral type scents. So I came back with some samples of some that she mentioned being interested in and she picked the Jasmine. You have your bakery type people, sweet type scents people and you have the floral people. It is funny how a scent that I like another hates and vice versa. This happens for me often as one of my top selling scents is coffee. I hate coffee scents they always smell like a skunk if you ask me, but to a coffee lover it smells wonderful. So I can understand why the floral client didn’t like any of my other soap scents. 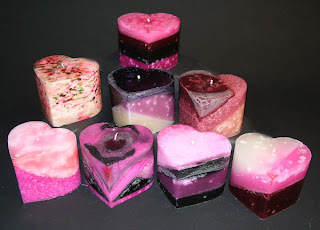 Next up in the candle making will be a pair of cranberry woods candles and 1 vanilla and 1 lavender heart candles. Really can’t wait to get done with the 5 batches of Jasmine soap so I can make a new scent I got called Mango Mandrin that one is calling my name! where has the time went? 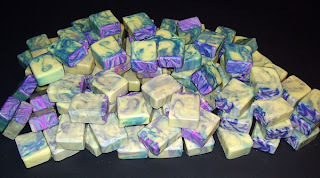 This last week I made fresh batches of Tropical Sunset(Honey Coco Mango) and Cupid soap. Also been making a number of pillar candles, this week’s main scents have been Pink Sugar and Crackling Firewood. Funny story I had a stuffy nose this week and earlier in the week I had made a hot pink heart candle in blueberry and also in Pink Sugar. Well I had left the extras in pots and when I wanted to use the pink sugar one in another candle I couldn’t smell which pot was the right one!!! I decided to wait a few days till I could smell again before I attempted to make the pink sugar one just in case I picked the wrong one. Talk about candle makers nose right?